Techie.Buzz – Getting the latest tech news to you! (Reuters) – Microsoft Corp on Wednesday briefly topped $1 trillion in value for the first time after executives predicted continued growth for its cloud computing business. The Redmond, Washington-based company beat Wall Street estimates for quarterly profit and revenue, powered by an unexpected boost in Windows revenue and brisk growth in its cloud business which has reached tens of billions of dollars in sales. Microsoft blocks Windows 10 May 2019 Update on PCs that use USB storage or SD cards Virtual reality as a treatment for ADHD? The future of cybersecurity: Your body as a hacker-proof network Galaxy Fold: What went wrong? Microsoft is doing its best to distance itself from being best-known as the Windows company. A Progressive Web App (PWA) is a combination of different web technologies and browsing interfaces. In a nutshell, PWAs are about creating app-like experiences on the web, and they aren’t specific to any particular device format. When the first websites emerged in the 90s, the idea of apps didn’t exist. Link: Are Progressive Web Apps the Future of Mobile? Author Techie.BuzzPosted on April 25, 2019 Categories UncategorizedLeave a comment on Are Progressive Web Apps the Future of Mobile? Microsoft’s cloud business is keeping investors happy with strong revenue growth. 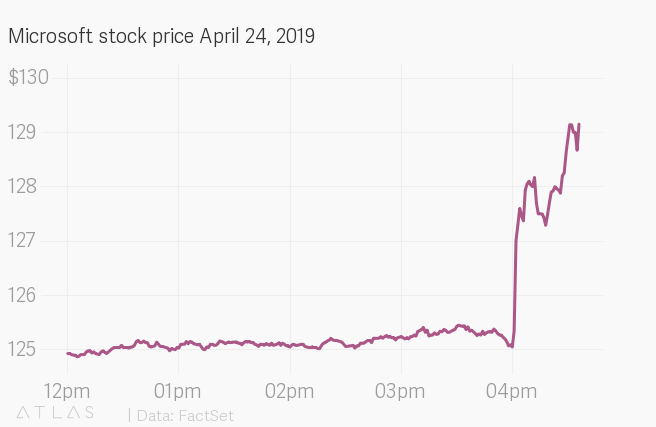 The company reported its earnings today (April 24), including $9.7 billion in revenue for its “Intelligent Cloud” business line, which includes sales of enterprise database software and use of Microsoft’s global network of data centers. Better iPhone data points build confidence in Mar Q results near the high end of guidance though June guide likely conservative. With negative buy-side positioning, we see a favorable setup despite YTD performance. We believe the stock can continue to work from here. Despite the 40%+ rally from the lows following the December quarter pre-announcement on Jan.
(Reuters) – Microsoft Corp beat Wall Street estimates for quarterly profit and revenue on Wednesday, powered by a surprise boost in Windows revenue and as growth in its cloud business stayed on track. Shares rose 3.after the bell, pushing the Redmond, Washington-based company’s market capitalization to nearly $1 trillion. (Reuters) – Microsoft Corp beat Wall Street estimates for quarterly profit and revenue on Wednesday, powered by adoption of its Azure cloud computing service and the subscription version of its Office software. Shares rose 3 percent after the bell, adding to the about 23 percent gain so far this year.